It's fair to say that the country is watching Katelyn Tuohy this weekend. That would be a hard idea to fathom for anyone, but the two-time Gatorade Athlete of the Year winner and Nike Cross Nationals winner has largely feathered away any pressure to this point in her career. At this point, it comes with the territory. 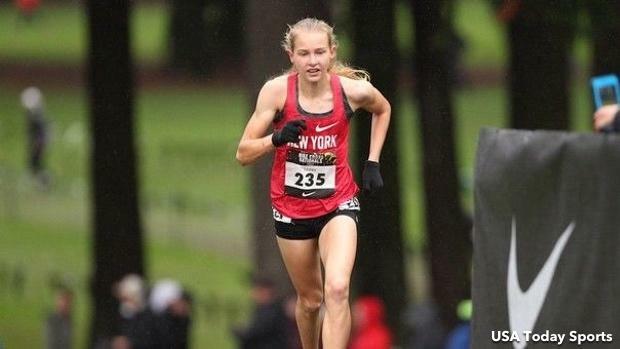 The North Rockland (NY) High School junior is headed to the New Balance Shore Coaches Invitational on Saturday at Holmdel Park in New Jersey to piece together another hard effort on cross country soil. Her team, meanwhile, will look to improve on its win from Ocean State. So what is the junior capable of on this course? Tuohy will be just two weeks removed from the Ocean State Invitational, when she ran 16:06.87 at Goddard Park East in Rhode Island, securing the fastest overall 5K for a high school girl. The all-time course record for a high school girl was set in 2010 by Highland Regional's (NJ) Megan Venables, who crossed the finish in 17:28.00. Just three girls have broken 17:45.00 on the course all-time, while 11 have broken 18 minutes. That bar may be a little too low. If we consider the progression the junior has shown from her cross country season last year to now, Tuohy is on a path to severely crush this record. While it's unwise to project any grand statements, we do have to at least consider them. We should keep in mind some context on the boys side, since the junior could potentially slip under 17 minutes for 5K. A total of 684 boys have broken 16:30 at Holmdel all-time, while 433 have broken 16:20 and 265 have crossed the line in 16:10.00. It seems a little unfathomable for Tuohy to break 16, but if in fact that does occur, she would enter an arc that includes just 147 boys all-time who have broken that mark.